The top range of the whole Sunseeker yacht production, has recently been expanded thanks to this new 82', currently the smallest of the fly motoryachts in the range. As is by now customary for the English boatyard, the development of this project is a result of close collaboration between Don Shead, who is the "author" of the water lines, Ken Freivokh, interior design, and Sunseeker Design. Logical, therefore, that even this maxi should keep a firm hold on that aesthetic and technical personality that is common to all Sunseekers, certainly able to make it immediately identifiable and appreciated. The overall design, sporty but at the same time elegant, is a successful mix of taut rounded shapes, into which numerous glass surfaces have been cleverly inserted, giving it a slimmer, more streamlined silhouette, and also contributing in a decisive way to light and airiness inside. The interiors are characterised by the presence of a large saloon that, with standard fittings, offers a spacious living area with sofas placed opposite each other, a dining area with a table for 8 in front of the kitchen. 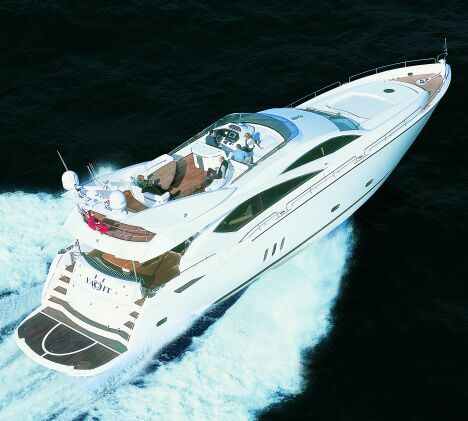 Below deck, still in the standard version, this 82' boasts a large owner's cabin amidships with en suite bathroom. Then there are two guest cabins, one on each side, the one to starboard with twin beds, the other with bunks, a large bathroom and at the extreme bow, the VIP cabin, this too with a large private bathroom, wardrobe and "vanity" corner. The crew has a separate area, located astern to offer maximum privacy, with two separate cabins and bathroom. Obviously, as is always the case with boats of this level, the boatyard is able to propose alternative solutions for developing each room, so as to offer a good level of personalisation that fully meets everyonès needs.